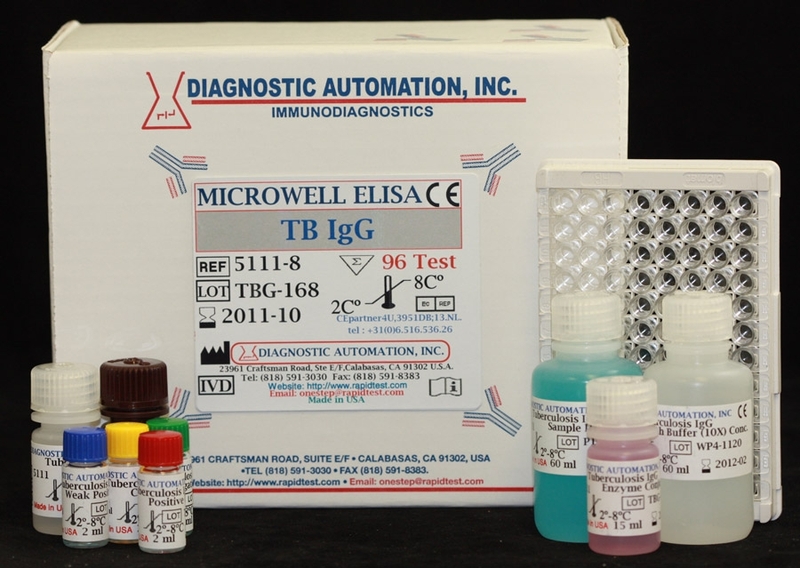 Diagnostic Automation Inc. Mycobacterium Tuberculosis ELISA Kit is an Enzyme immunoassay (EIA) for the detection and quantitative determination of human IgG antibodies against Mycobacterium Tuberculosis in human serum and plasma. 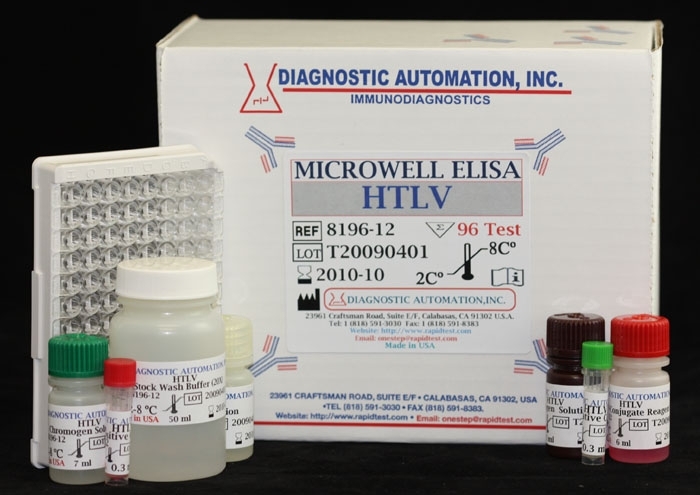 Further applications of this elisa kit in other body fluids are possible and can be requested from our Technical Service at 818-591-3030. Mycobacterioses (tuberculosis, leprosy, atypical mycobacterioses, paratuberculosis, and perhaps Crohnas Disease) are the infectious diseases of men and animals with the largest diffusion on earth. The infectious agents of tuberculosis are acid-resistant rod-like formed bacteria of the family Mycobacteriaceae, genus Mycobacterium. The germ was detected by Robert Koch in 1882. Owing to the very high infectious power of pathogenic mycobacteria, early diagnosis is essential to prevent spreading of the disease. Convergence of various approaches is necessary to control the mycobacterioses, immune reactions and bacterial shedding being variable during the diseases. However, usual diagnostic procedures were up to now unsatisfactory and did not allow distinguishing among different mycobacterial species. The illness is normally transferred by droplets of saliva from infected persons. 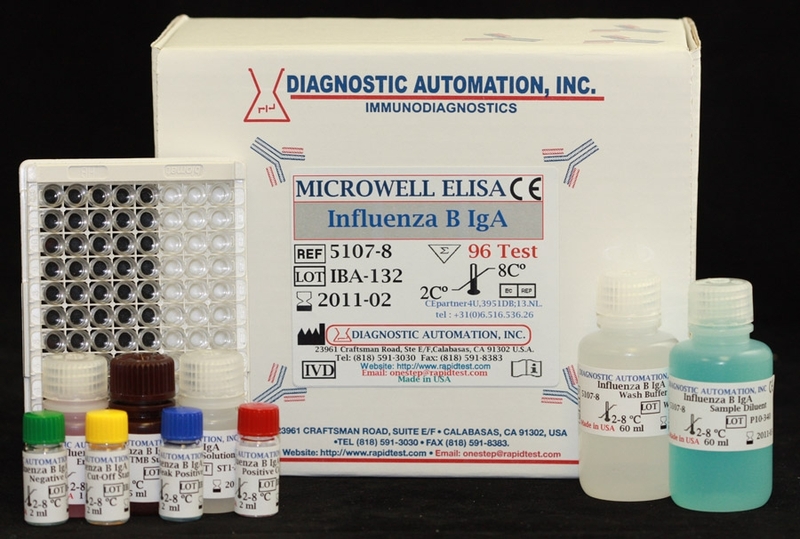 This ELISA test kit for the determination of IgG antibodies uses a cocktail of highly pure proteins in order to determine an immune response against the bacteria in human serum. 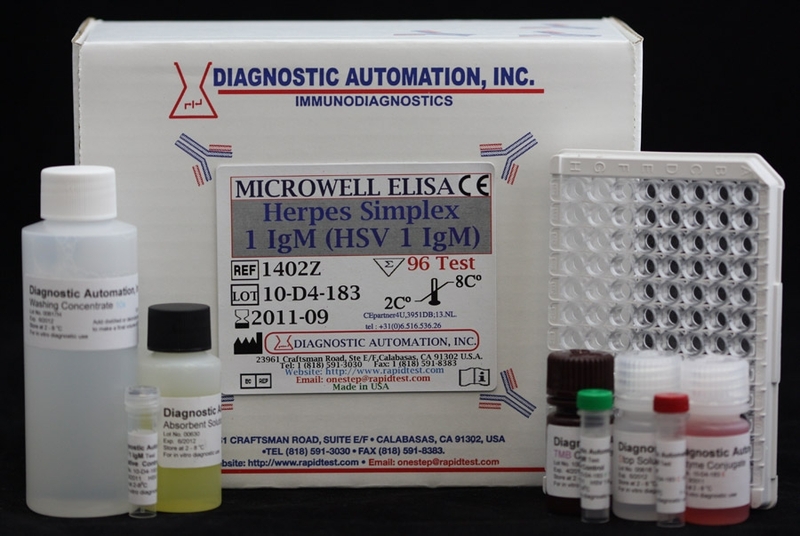 A fresh or chronically active infection can be diagnosed by IgA and IgM tests, which are also available. Mycobacterium tuberculosis antigen is bound on the surface of the microtiter strips. Diluted patient serum or ready-to-use standards are pipetted into the wells of the microtiter plate. A binding between the IgG antibodies of the serum and the immobilized Mycobacterium tuberculosis antigen takes place. After one hour incubation at room temperature, the plate is rinsed with diluted wash solution, in order to remove unbound material. Then ready-to-use anti-human-IgG peroxidase conjugate is added and incubated for 30 minutes. After a further washing step, the substrate (TMB) solution is pipetted and incubated for 20 minutes, inducing the development of a blue dye in the wells. The color development is terminated by the addition of a stop solution, which changes the color from blue to yellow. The resulting dye is measured spectrophotometrically at the wavelength of 450 nm. The concentration of IgG antibodies is directly proportional to the intensity of the color. All sera and plasma or buffers based upon, have been tested respective to HBsAg, HIV and HCV with recognized methods and were found negative. Nevertheless precautions like the use of latex gloves have to be taken. Toxoplasma gondii causes toxoplasmosis, a common disease that affects 30-50 of every 100 people in North America by the time they are adults. The mean source of infection is direct contact with cat feces or from eating undercooked meats. Toxoplasmosis generally presents with mild symptoms in immunocompetent individuals; in the immunocompromised patient, however, the infection can have serious consequences. Acute toxoplasmosis in pregnant women can result in miscarriage, poor growth, early delivery or stillbirth. Treatment of an infected pregnant woman may prevent or lessen the disease in her unborn child. Treatment of an infected infant will also lessen the severity of the disease as the child grows. 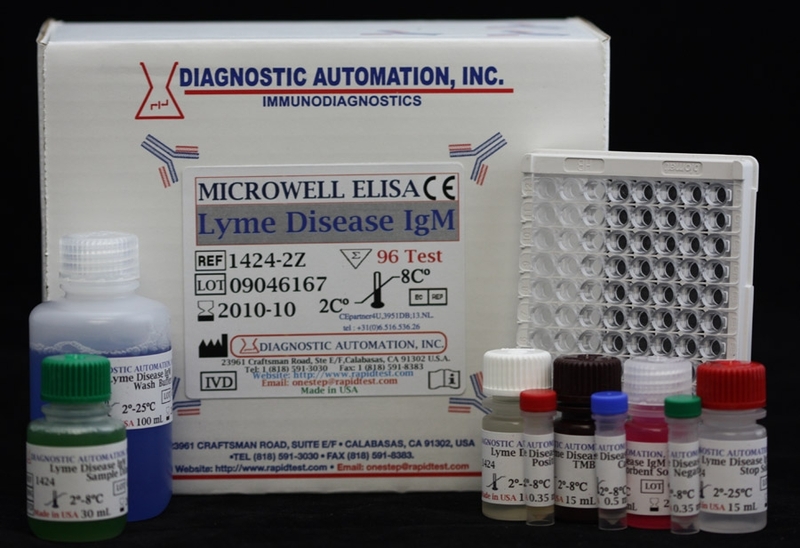 IgG and IgM antibodies to Toxoplasma can be detected with 23 weeks after exposure. IgG remains positive, but the antibody level drops over time. 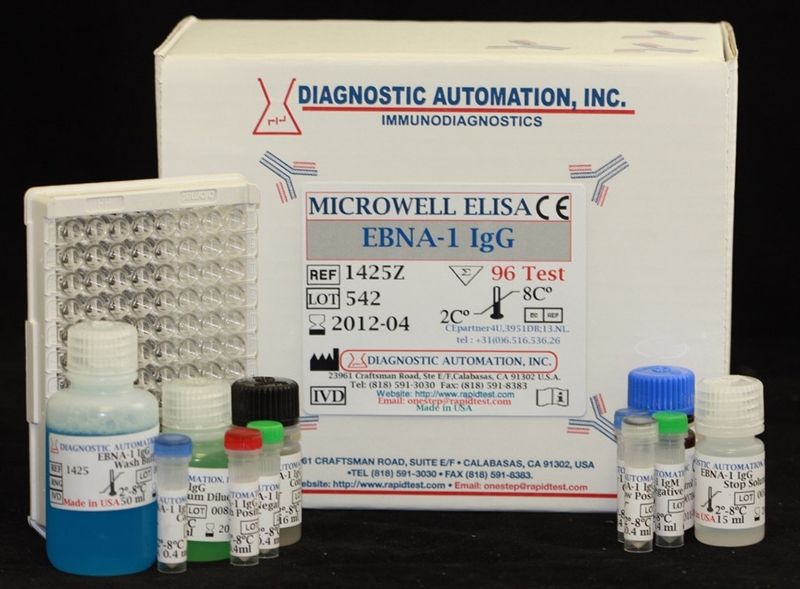 ELISA can detect Toxoplasma IgM antibody one year after infection in over 50% of patients. Therefore, IgM positive results should be evaluated further with one or two follow up samples if primary infection is suspected.